Reference: Michael Satchell, ‘Any color but green’, U.S.News & World Report, October 21 1991, p. 75; James Ridgeway and Jeffrey St.Clair, ‘Where The Buffalo Roam: The Wise Use Movement Plays on Every Western Fear’, Village Voice, July 11 1995, p. 15;David Helvarg, The War Against the Greens: The “Wise-Use” Movement, the New Right, and Anti-Environmental Violence (San Francisco: Sierra Club Books, 1994), p. 9. Wise Use groups are keen to point out that they work with corporations not for them. Not all the Wise Use groups get industry funding. In fact a few are anti-big business, although the rhetoric of most groups indicate strong free enterprise and libertarian ideals. Similarly many businesses don’t tend to openly endorse the Wise Use Movement for fear of alienating potential customers. 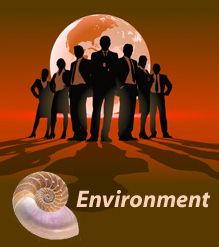 Helvarg argues that the movement pushes “a more radical core agenda of ‘free-market environmentalism,’ ‘privatisation,’ and the deregulation of industry” than most corporations are willing to own up to. Reference: Richard Stapleton, ‘Green vs. green’, National Parks (November/December 1992), p. 35. Reference: Richard Stapleton, ‘Green vs. green’, National Parks (November/December 1992); James Ridgeway and Jeffrey St.Clair, ‘Where The Buffalo Roam: The Wise Use Movement Plays on Every Western Fear’, Village Voice, July 11 1995, p. 15; O’Callaghan, ‘Whose Agenda For America?’, p. 86. Whilst many of the Wise Use groups get industry funding directly, funding is also raised by Alan Gottleib who runs a direct-mail operation with a claimed 5 million addresses of possible donors, which he says has raised $5 million for Wise Use groups. Gottlieb is also a fund raiser for Republican candidates and conservative causes including the National Rifle Association. Reference: Kate O’Callaghan, ‘Whose Agenda For America?’, Audubon (September/October 1992), p. 86; William Kevin Burke, ‘The Wise Use Movement: Right-wing anti-environmentalism’, Propaganda Review, No. 11 (1994), p. 4; R. Edward Grumbine, ‘Wildness, Wise Use, and Sustainable Development’, Environmental Ethics, Vol. 16 (Fall 1994), p. 241. The Wise Use movement is fairly influential in the Republican Party. Gottlieb’s involvement in fund raising for Republican candidates has included Ronald Reagan’s reelection campaign in 1984 and parts of Robert Dole’s 1988 presidential campaign. The Wise Use Agenda features George Bush on its back cover shaking hands with Allan Gottlieb and in 1992 George Bush denounced “environmental extremists” for locking up natural resources. A number of congressmen from Western States have also endorsed the Wise Use agenda. In 1992, Audubon magazine reported that the advisory board of the Center for Defense of Free Enterprise included seven US senators and nine members of the House, including the Secretary of Defense. Reference: Jennifer Hattam, ‘Wise use movement, R.I.P. ?’, Sierra, 86(3), May/Jun 2001, pp. 20-21. 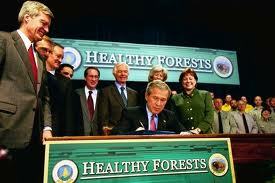 Like his father before him, George W. Bush has provided wise-use advocates a safe harbor within his administration... Of the 58 people appointed by President Bush to help shape the Interior Department, more than half are industry lobbyists, executives, and consultants, and 12 are active in the antienvironmental "wise-use" movement. Reference: Vince Bielski, ‘Armed and dangerous: the Wise Use movement meets the militias’, Sierra (September/October 1995), pp. 33-35; James Ridgeway and Jeffrey St.Clair, ‘Where The Buffalo Roam: The Wise Use Movement Plays on Every Western Fear’, Village Voice, July 11 1995, pp. 15-16. Connections have also been alleged of a Wise Use Movement association with right wing militias and also with Reverend Sun Myung Moon’s Unification Church. According to the New York based Village Voice and the environmental journal Sierra, Ron Arnold was on the council of a Wise Use group called the National Federal Lands Conference (NFLC) which “enthusiastically endorsed the creation of militias in its October 1994 newsletter.” However after the Oklahoma City bombing in April 1995, the Wise Use Movement has done its best to distance itself from the militias and Arnold says that the NFLC is the only Wise Use group that he knows which supports militias. However environmentalists claim that anti-environmental, property rights literature is distributed at various militia meetings and that the militia groups use Wise Use groups as an organising base. Reference: Richard Stapleton, ‘Green vs. green’, National Parks (November/December 1992), p.37; William Kevin Burke, ‘The Wise Use Movement: Right-wing anti-environmentalism’, Propaganda Review, No. 11 (1994), p. 5; Kate O’Callaghan, ‘Whose Agenda For America?’, Audubon (September/October 1992), p. 87; Greenpeace, ‘The Things you need to know about Ron Arnold and the “Wise Use” Movement. Greenpeace Fact Sheet.’, GreenDisk, Vol. 3, No. 3 (1994); Dan Baum, ‘Wise Guise’, Sierra (May/June 1991), p. 92. Another group that has been bringing disrepute to the Wise Use Movement is the American Freedom Coalition (AFC). AFC is reported to have been founded by a ‘lieutenant’ of Moon’s and funded to the tune of $5 million by ‘business interests’ of the Unification Church to campaign for far-right political causes. According to some writers, AFC is a key group in the Wise Use Movement. In 1989 Ron Arnold was president of their Washington State Board and a registered agent of the AFC; Gottleib was a director of the Washington State Board and owned the building in which the AFC had its office. Another movement organiser was also a paid by the AFC. It has sponsored several Wise Use conferences, including the first Wise Use conference in 1988. 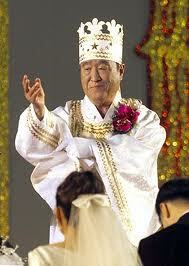 However, wise-use activists strongly deny any connection with Moon or his Unification Church. Reference: William Kevin Burke, ‘The Wise Use Movement: Right-wing anti-environmentalism’, Propaganda Review, No. 11 (1994), p. 6;Kate O’Callaghan, ‘Whose Agenda For America?’, Audubon (September/October 1992), p. 88. Because of these alleged connections, which have had a fair bit of publicity, some Wise Use groups have tried to distance themselves from Ron Arnold and the Center for the Defense of Free Enterprise and even from the term Wise Use by using terms like ‘multiple use’ and ‘prudent use’ and portraying themselves as more moderate.